Life just keeps getting better. Ubuntu 12.04 "Precise Pangolin" is a big step up from the mishegoss that preceded it. The Unity desktop was promoted to Ubuntu's default before its time, but has seen steady improvement since. There are folks who will love the Launcher and the Global "Mac-style" Menus... I just don't happen to be one of them. To give you a fair look at it, though, check out this on-line tour of the Unity interface. Try to ignore that the default wallpaper looks as though someone painted the screen with melted Skittles. 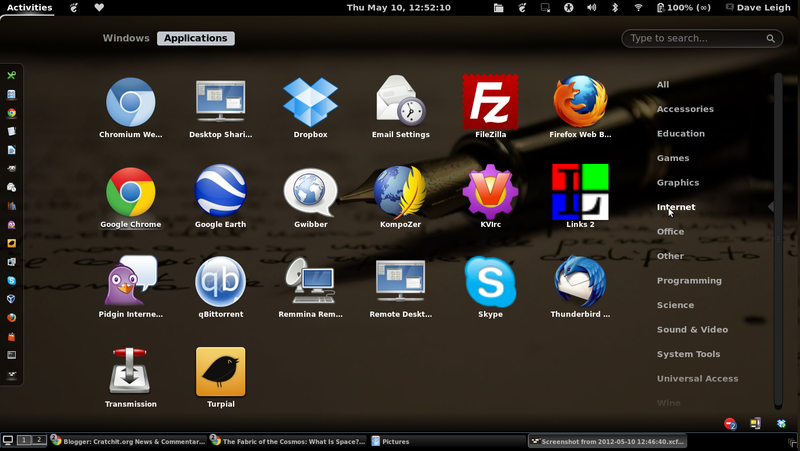 MUCH better for me is GNOME-shell, which is easily installed from the Ubuntu Software Center. additional workspaces will be exposed on the right. 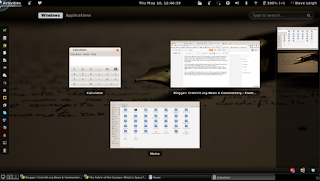 As has long been the case, Linux provides multiple workspaces so you can compartmentalize your work. GNOME makes this easy... just drag one of the apps onto the empty workspace at the right. The app will be moved there, and a new empty workspace will be created automatically. There are no more static limits to the number of workspaces. At the top of the overview there's an indicator that the screen is displaying either Windows or Applications. your text cursor will be placed in a search box. This is smoothly animated, and against my expectations it's very natural. It's become my default method of switching between full-screen apps. If you start typing, then your search results will be displayed immediately. Here I've typed "scr" and GNOME's responded with a number of likely items. You'll notice that here it's categorized the results into "Applications", "Settings" and "Contacts". Also note that the settings that are returned are things that have to do with screen settings, but don't necessarily have "scr" in the name. And what's "Caffeine" doing there? Well, it's an app that prevents your screensaver from activating while you're watching a movie. As you can see, the search feature presents results based on your likely intentions. It also works around spelling mistakes. The menus aren't displayed in drop-down lists as they used to be, but that doesn't mean they're exactly gone. Clicking on Applications at the top of the screen reveals the menus as a grid of oversized icons. By default all items are displayed, but you can click on one of the categories at the right to narrow your view. These exactly correspond to the old GNOME menu categories, so everything's familiar. Also, when the Software Center installs a new program, you're told exactly where it went in the menu structure. That's kind of moot though, because it's faster to type a few letters of the program name or action you want to take and it's faster than looking through the menus. For instance, if I want to use a spreadsheet, I tap the System key and start typing "S-P-R" and by that time I'm presented with LibreOffice Calc and Calligra Sheets. Now, GNOME-shell is very cool, but even better than that is GNOME-shell plus extensions, which can be had from https://extensions.gnome.org/; which, incidentally, has one of the finest designs I've ever seen for a website of its kind. You visit a page and click a toggle to install or deactivate an extension. It's just that easy. 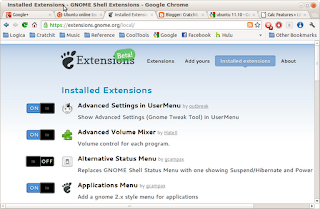 You can even manage your installed extensions from here. Those toggles on the webpage are functional. 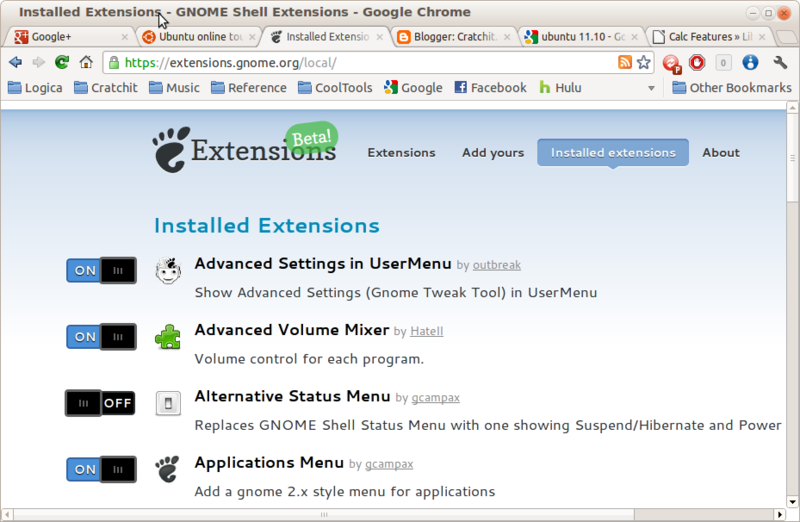 That said, I'm going to leave you with a list of my installed extensions, and links to them. I won't describe them; instead I'll let the site do that. You'll either appreciate the utility or you won't. In general, they either restore the drop-down menus I've become accustomed to or give me more granular control over the system.